Wet Gate performed an outdoor concert in the Northern California town of Philo on Friday the 13th of June, 2003. This performance was held in conjunction with Faites de la Lumiere's "Luminosities 2003", a coordinated event held in cities and towns in countries around the world. 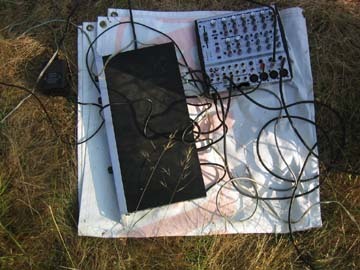 Wet Gate's modified projectors were arranged in ankle-high grass in a field behind radio station KZYX (the local NPR and Pacifica affiliate). 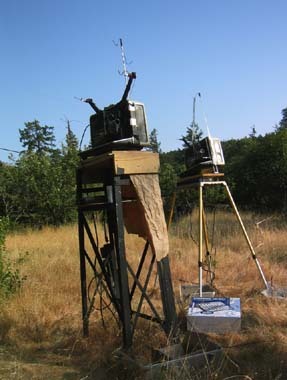 The three members improvised 90 minutes worth of material, using a large ComSat dish (used to receive NPR programming from satellite) as a screen surface. 16mm audio was broadcast through speakers placed in front of the screen. As the sun set behind the dish-screen, the performance began. 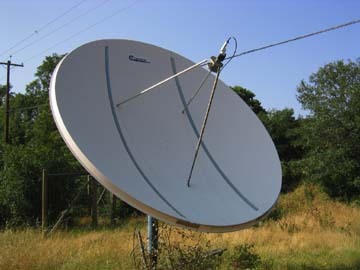 90 minutes later, a full moon rose on the opposing horizon and cast a glow across the dish surface, replacing the cinema images and signalling the close of the performance. Documented with a stationary video camera, excerpts from the concert may be viewed in QuickTime video format via the links below. Each download is 12-17 MB in size.